Lobster, lobster and more lobster! 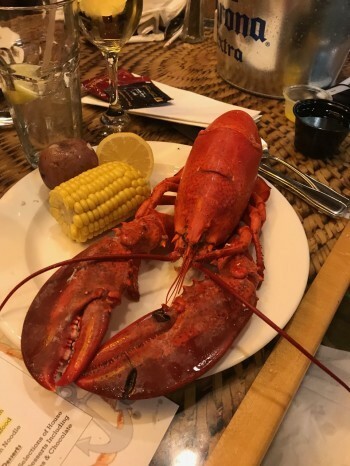 Pechanga Resort & Casino in Temecula, California, ships in 2300 live Maine lobsters a week for its scrumptious new Lobster & Seafood Extravaganza Buffet that was recently launched on Thursday nights. Last week we enjoyed this buffet and savored every morsel. The just-cooked Maine lobster is served in a net bag in an East Coast lobster bake style with roasted potatoes, corn on the cob, and melted butter on the side. The lobster melted in our mouths and it was wonderful to know we could keep going back for more. 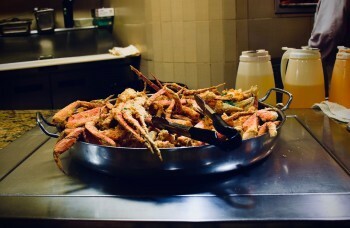 In addition, we helped ourselves to other seafood treats such as gourmet sushi, oysters, salmon, snow crab, calamari, Dungeness crab, clam chowder, ceviche and steamed shrimp. Pechanga’s other traditional dining stations were also available with enticing Mexican, Italian and Asian dishes plus a healthy salad bar and an extensive selection of delectable desserts. We started with a fresh lettuce salad and bruschetta with a variety of toppings. Then we sipped on chunky clam chowder and a plate of tasty shrimp with cocktail sauce and tangy ceviche. Before we were too full, we moved on to the beckoning lobster plate. The lobster could not have been more tender and flavorful. We were tempted to have a second lobster, but there was so much else to try such as the delicious snow and Dungeness crabs, which we cracked ourselves. Then of course we had to sample some Italian pasta and the Asian stir-fry. Yes, we were getting full, but who could turn down the chocolate mousse, carrot cake, cheesecakes and other tempting desserts? By the time we were finishing our lobster dinners, all the tables around us were full. There is no doubt that this addition to Pechanga’s many dining options is becoming very popular. 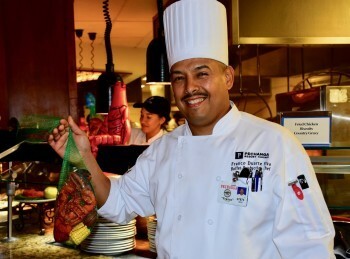 The Seafood Extravaganza is offered to adults and children aged 3 to 11 for $44.99 from 4 p.m. to 10 p.m. with special discounts for Pechanga Club members. Children aged 2 and under are free. Photos taken by Todd Montgomery.